Tax Expenditures (credits, deductions, special rates, deferrals and exclusions) are the worst part of the budget. The chart at left combines the U.S. Treasury's projections through 2016 with tax expenditure spending estimates for the same time frame prepared by the Tax Policy Center. In the short term the projections show revenue going up and spending going down. 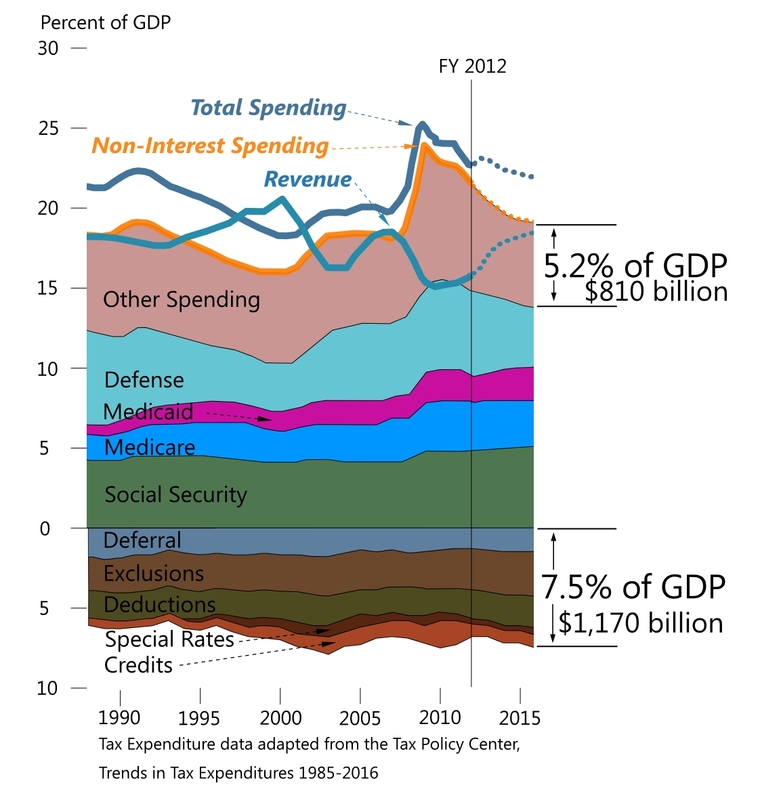 This suggests that budget and tax reform may not be quite as urgent as some in the "fix the debt" crowd have suggested. There is time to make sure that the economy recovers from the Great Recession and the unemployment rate comes down before finalizing consensus on much needed, "once in a generation" tax reform. A growing number of advocates want tax reform that will reverse the long term decline of the poor and middle class. The Government took potentially significant steps towards fiscal sustainability by enacting: (1) the ACA in 2010 and (2) the BCA in 2011. The ACA holds the prospect of lowering the long-term per beneficiary spending growth for Medicare and Medicaid, and the BCA significantly curtails discretionary spending. Together, these two laws substantially reduce the estimated long-term fiscal gap. But even with these new laws, the Government's debt-to-GDP ratio is projected to increase continuously over the next 75 years and beyond if current policy is kept in place, which implies that current policy is not sustainable. Subject to the important caveat that changes in policy not be so abrupt that they slow the economyâ€™s recovery, the sooner policies are put in place to avert these trends, the smaller the revenue increases and/or spending decreases will need to be to return the Government to a sustainable fiscal path. 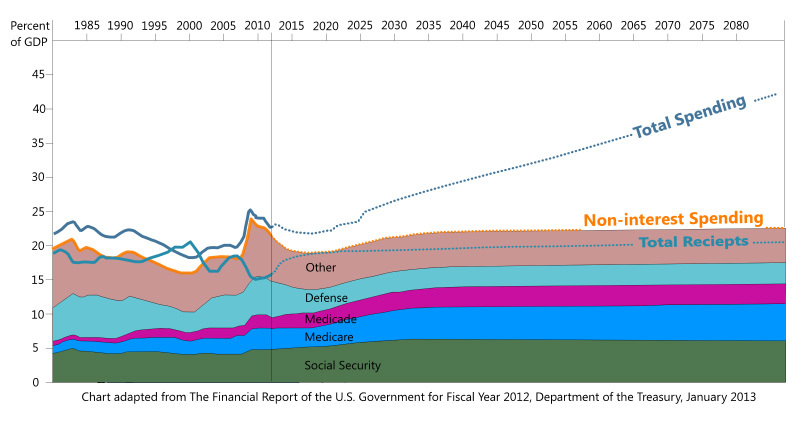 The introduction to the Financial Report contains "Chart 5: History and Current Policy Projections for Receipts, Non-Interest Spending and Total Spending" which has been adapted and reprinted below. The projected cumulative deficits will cause spending for interest (on the mounting debt) to escalate at an alarming rate. The debt to GDP ratio was, "73 percent at the end of fiscal year 2012 and under current policy is projected to be 78 percent in 2022, 145 percent in 2042, and 395 percent in 2087," according to the report. Treasury suggests that fiscal prudence requires an almost immediate increase of the average primary surplus to 2.7% of GDP between 2013 and 2087. This translates to a combination of tax increases and spending cuts of about $420 billion a year in present dollars. The President and Congress have been generally considering reforms which are a fraction of this amount. If nothing is done about the deficit until 2023, an average surplus of 3.2% of GDP will be needed; and if congress waits until 2033 to fix the problem, an average surplus of 4.1% of GDP will be needed.